Sweetly scented, large, soft pink flowers with golden-yellow centres in May and June and purple-flushed, mid-green leaves. 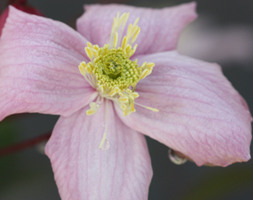 This fast-growing clematis is excellent for training over a pergola or covering an unsightly wall or fence in a north-facing site. Plant near an entrance or path where the delicate almond fragrance can be appreciated.